Sen. Marco Rubio (R-Fla.) and 2016 GOP presidential candidate stated at a speak on Monday on national security at the American Legion in Hooksett, N.H. that Barack Obama has intentionally and deliberately weakened America both home and abroad. No kidding, really? Just curious, what has the establishment GOP done to prevent or stand in the way of Obama’s actions? Obama stated he was going to fundamentally change America, and sadly he has while Republicans in the House and Senate have done nothing. Rubio also called Democratic presidential front-runner Hillary Clinton a “liar” on foreign policy. Tell us something we don’t know. She is pretty much a liar in general. Red State opines, Marco Rubio Is More Right Than Donald Trump On Obama’s Foreign Policy. That may be, but he scared the GOP base on immigration. Sen. Marco Rubio (R-Fla.) is accusing President Obama of intentionally weakening America at home and abroad. “It’s now abundantly clear: Barack Obama has deliberately weakened America,” Rubio said early Monday during a speech on national security at the American Legion in Hooksett, N.H. He also criticized Obama for ignoring international challenges and eroding safety at home. “America is in far greater danger today than it was eight years ago,” Rubio said. “Our president thought he could make America like Luxembourg or Switzerland. But he can’t. Rubio cited China, Iran, Russia, Syria and North Korea as some of the global hotspots that have deteriorated on Obama’s watch. IMAGINE WHAT IT WOULD BE LIKE WITH A PRESIDENT WHO ACTUALLY WANTED TO PROTECT AMERICA AND KILL TERRORISTS? Sen. Ted Cruz (R-Texas) and GOP Presidential candidate rolled out a a series of TV ads in Iowa on Saturday, taking aim at the the incompetence and weak handed approach of dealing with terrorism by both Barack Hussein Obama and former Secretary of State under Obama, Democrat front runner for the party nomination, Hillary Clinton. The ad is particularly timely as law enforcement is investigating Wednesday’s San Bernardino, Calif., shootings as an act of terrorism. Cruz and rival presidential candidate Sen. Marco Rubio (R-Fla.) have recently exchanged national security jabs after Cruz supported a National Security Agency reform bill this year, which is touted by privacy advocates but opposed by some Republicans who believe it will weaken U.S. intelligence activities. Cruz also debuted a second ad touting an endorsement from Rep. Steve King (R-Iowa). Ahead of the Iowa caucuses in February, Cruz ranks third in GOP presidential polls in the Hawkeye State, trailing Donald Trump and Ben Carson. It would appear that “We the People” are fed up with Obama, Clinton and Democrats telling them that they are racists, bigots and Islamophobes when it comes to the war on terror against radical Islam. According to a recent Rasmussen Report poll, 60% of Likely U.S. Voters believe the United States is at war with radical Islamic terrorism and just 24% share the president’s position and disagree. This is rather interesting heading into a presidential election in 2016 as Obama and Democrats refuse to use the term “radical Islam” for fear of hurting the feelings of Muslims. But as BPR opines, its not just Republicans voters who feel this way, 56% of Democrats believe America is at war with radical Islamic terrorism and 54% of voters not affiliated with either major party. 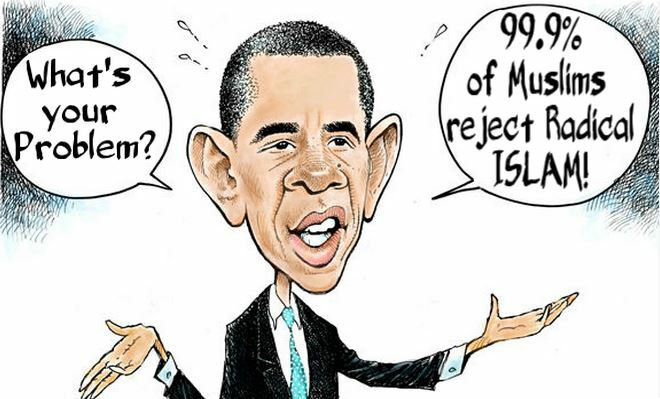 ISIS and terrorism under Obama isn’t going away any time soon as Barack Obama refuses to take the issue seriously which means that this will be a huge campaign issue in 2016 and the Democrats are not even close to being on the right side of the issue with the American people.